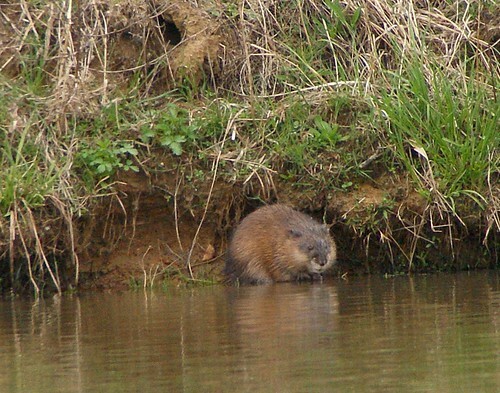 Last weekend, while back at my pond fishing, I watched two very busy muskrats. At first, I only saw one, which continued to swim back and forth. Then, another one joined it, and they swam back and forth together. Is anyone else thinking "Muskrat Love"? So, they both got to the bank near me, and one of the muskrats (the one I decided was Susie, the female - you'll see why), started yipping (kinda like a puppy yip). She just kept it up, and wherever the other muskrat (Sam) would swim, Susie would follow, yipping at him the whole.dang.time (Do you see why I decided that one was the female? hehe). All of a sudden, like they had just been hit with electronic muscle stimulation, they got into a little wrestling match (honest, that's what happened - this is a G rated blog, y'all), and the one I decided was Sam took off across the pond and left his yipping Susie at the other end. Geesh - love em and leave em, I guess! Fabulous, Misty, seeing muskrats AND muskrat love. Doesn't happen very often in the camera critter biz, I bet. I should take up fishing again. Maybe I'd see something exciting. I love the look on it's face in the second one. Great sighting and a cute story. Great shots of the muskrats. Nice fluffy critters!Completely new to me,I goggled them. Who knew of semi-aquatic rodents! Who knew somebody would be watching .. lol. Super images. Weekend Update: Chilling out today; walk with friends tomorrow and birding on Monday. FAB. I bet he never calls again :). Nice capture! Great photos of the muskrats. Here's my critters post. Have a nice Easter celebration. Oh, what great shots! 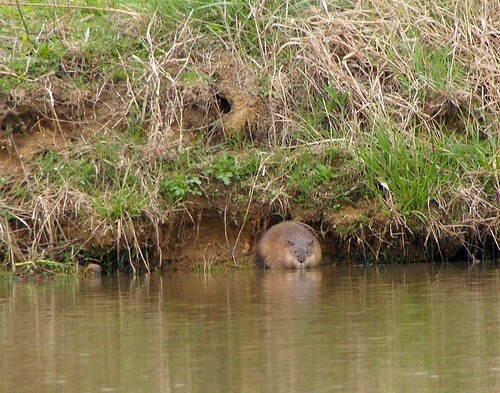 How lovely to see these critters at the river bank. IT is a good post there are we see the all and many picture of the animal and its very good picture and shot.